Videostrong KI Plus is one of the first Amlogic S905 TV boxes to be launched on the market, and it also happens to be one of cheapest model selling for around $45 on various sites, and it’s even available for $39.99 on GearBest for Black Friday / Cyber Monday. I’ve posted the specifications and pictures of the device previously, and after updating the firmware, I’ve finally completed the review. As usual, I’ve connected a whole bunch of cables and peripherals to the device to make the power supply can handle it, including a USB hard drive, a USB webcam, a USB keyboard, a USB hub with two RF dongles for Tronsmart Mars G01 gamepad and MeLE F10 Deluxe air mouse, as well as a HDMI, optical audio and Ethernet cables, and a speaker connected to the 3.5mm AV jack and powered by one of the USB port of the device. Turn on the power, and the device will boot automatically (no need to press the power button), with a typical boot taking around 48 seconds. I quickly tried one of the streams and it worked OK. 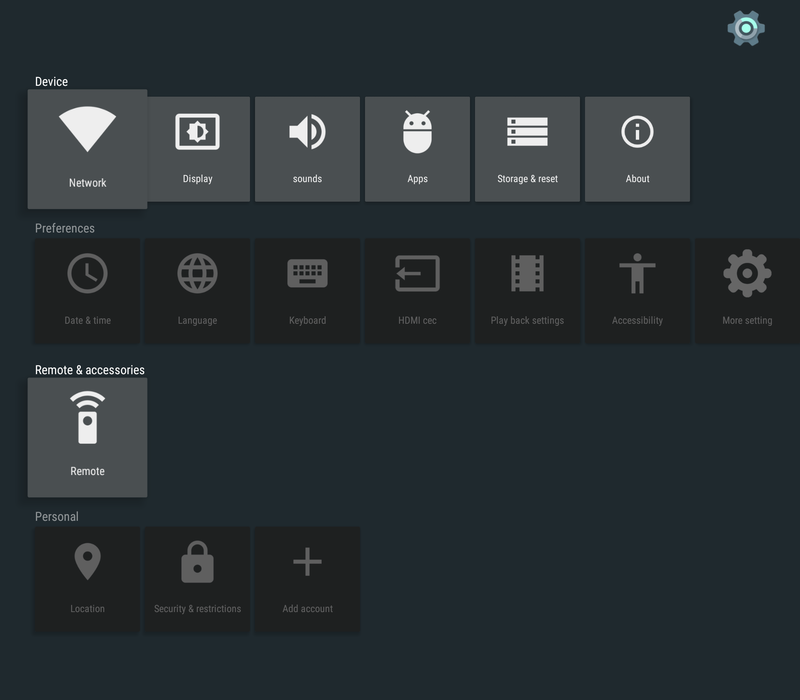 The settings’ user interface is basically the same as found as on Android 5.1 Amlogic S812 TV boxes such as WeTek Core, minus some features like automatic frame rate switching. I had no problem to connect to my WiFi router, and setting video to 4k2k 60Hz also worked perfectly via Onkyo TX-NR636 AV receiver or LG UHD TV. However, the box did not always keep my video output settings, often falling back to 1080p50. I only tested the AV port by connecting it to my speakers, and it worked fine with both HDMI audio and stereo audio outputted at the same time. You can get to Lollipop Android settings by selecting More Settings. Bluetooth is not built-in into the device, and is completely missing from the settings, so even if you decided to connect a Bluetooth USB dongle it would not work. All other usual settings appear to be here including Printing, Language & input, accessibility and so on. A single 4.66GB partition is used for both app and data with around 4.21GB free space. The “About Mediabox” section reports KI Plus model running Android 5.1.1 on top of Linux kernel 3.14.29. There’s also a link to the Update&Backup app in this section, but OTA firmware update is not enabled. The sample was sent to my by a manufacturer (Videostrong), and they probably rely on their customers to handle this. This firmware is not rooted by default. Google Play Store did not work well at all the first time, with most application being incompatible with this device. That’s why I delayed the review, and after installing a new firmware, everything works pretty well. Applications that require telephony, Bluetooth, and GPS can’t be installed, but that’s fine, as well as the ones which can’t be installed where I live (country limitations). Finally I installed Amazon Underground to load and play Riptide GP2 3D racing game. Power handling has been implemented correctly as I could cleanly power off the device with either the power button on the unit and the remote control. The remote control can also be used to power on the device. There’s no standby mode, so the device will fully boot each time you turn it on. There’s still some residual power used in power off mode, but at least the USB ports are turned off. Temperature is under control most of the time, except possibly when playing games. I measured 42°C and 53°C on the top and bottom of the enclosure after running Antutu 5.7, but after playing Riptide GP2 for about 15 minutes the temperature went up to 50°C and 62°C, and I noticed a lower frame rate in the game. After updating the firmware, the first impressions were quite good, as despite its low cost, the system was responsive, and stable, which everything from networking to video output working fine, except for video output changing randomly? after a power on. I usually playing videos from a network share over Ethernet and using whatever Kodi version is pre-installed on the device. 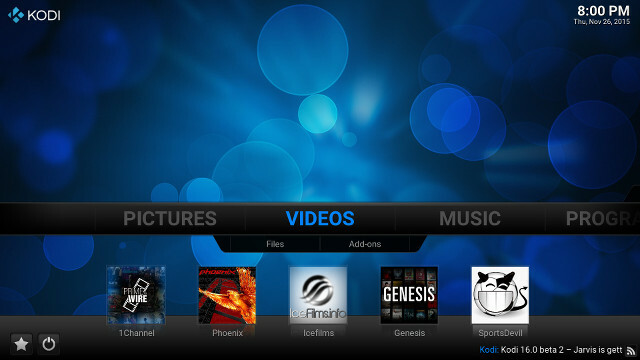 So far none of manufacturers have used Kodi from Google Play, and Videostrong is no exception. So I have some Kodi 15.2 app in the device with various add-ons. For some reasons, the resolution is shown as 1280×720 @ 60Hz in the System information when the video output is set to 4k2k-60Hz, and despite the framebuffer being set to 1920×1080 as we’ve seen with some of the screenshots above. So while all videos could play, most of them would be letterboxed. So with this bug in mind, and my contacts telling me either Amlogic had not spent much resources on Kodi this time, or that many patchsets were still submitted to Kodi to fix Amlogic S905 support, I decided to give up on Kodi on this device, and instead do all my testing with Video Player app in Android. That means you’ll either need to wait for Kodi 16, or go with the daily builds. I did not re-test the videos at 1080p in Kodi 15.2, as I’m expecting 2 to 3 more Amlogic S905 TV boxes, and I’ll ahve plenty of opportunities to test Kodi on Amlogic S905, so instead I’ll report results in Video Player, using Ethernet, unless otherwise stated. Jellyfish-120-Mbps.mkv (120 Mbps video without audio) – Not very smooth (played from USB hard drive, as Fast Ethernet could not handle this file). The audio issues are probably due of the lack of DTS and Dolby licenses, and I could confirm it in the audio test below. So if you don’t have AV receiver you are out of luck to get any audio, unless you use Kodi, which may not work that well right now, or some other app that also decoded DTS and Dolby by software. HD.Club-4K-Chimei-inn-60mbps.mp4 – OK from USB HDD, but buffering a lot from network. sintel-2010-4k.mkv – OK, but no audio. BT.2020.20140602.ts (Rec.2020 compliant video) – OK from USB HDD (first time ever! ), but buffering from network, or even stopping in some instances. Samsung_UHD_Dubai_10-bit_HEVC_51.4Mbps.ts (10-bit HEVC / MPEG-4 AAC) – Perfect from HHD, but buffering a lot from SAMBA share. 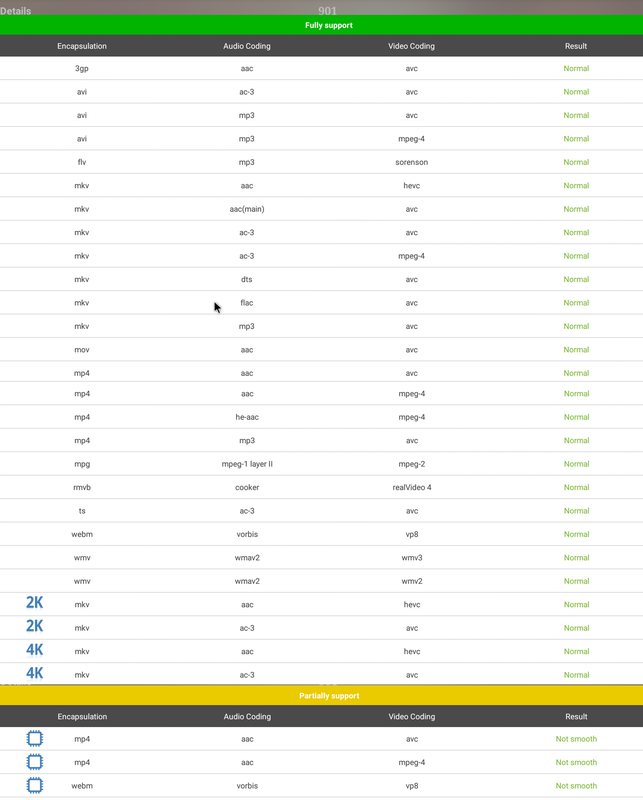 You can watch a demo with most of these files via the post entitled “H.264 & H.265 4K Video Playback on Amlogic S905 Android TV Box“. 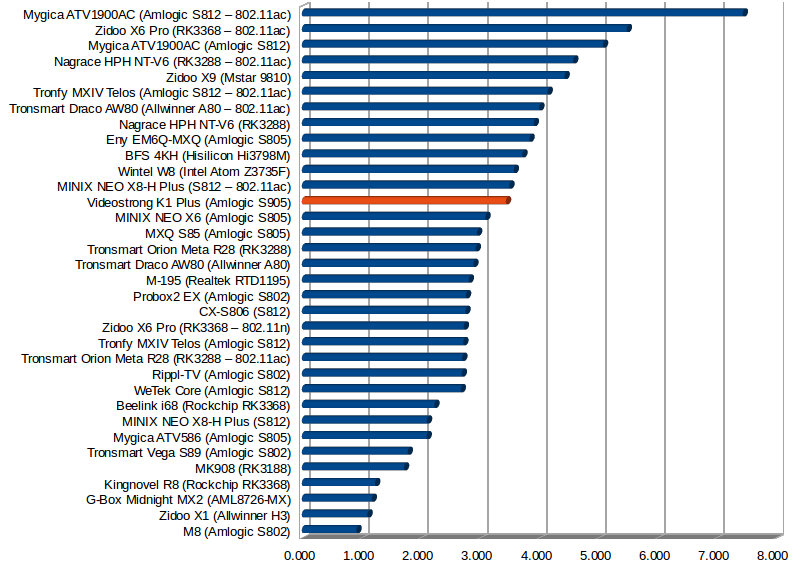 While VP9 and H.264 @ 60 fps are not supported by current revision of S905 processor, I understand a new revision of the silicon should support VP9. Video Player reports “can’t play this video” when I try to play Blu-ray ISO files such as Sintel-Bluray.iso and amay.iso, so I think it’s just not supported by the app. 1080i MPEG2 video samples (GridHD.mpg & Pastel1080i25HD.mpg) played OK, but Hi10p had the same artifacts issues as on Kodi on Amlogic S812, and lacked the subtitles. Lack of DTS/Dolby support was the main issue when I played several H.264, DViX/XVid, VOB, MKV, and MP4 movies, as many did not play audio at all, and Video Player app can not handle FLV videos, nor IFO files (although VOB is OK). 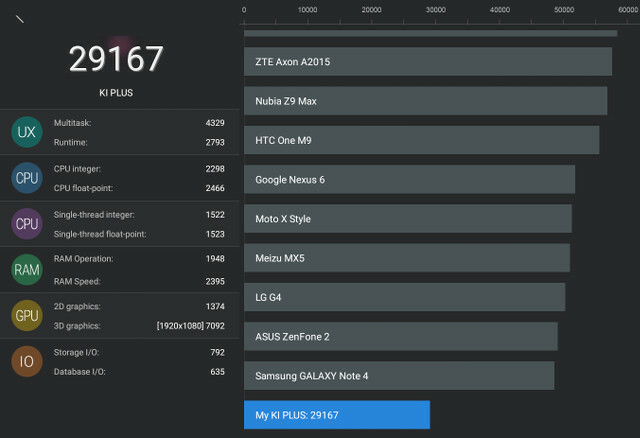 I installed Antutu Video Tester 3.0 manually, and the score (906 point) is pretty good, although not quite as high as on Amlogic S812 devices (1,000+ points). If you are using premium video streaming applications such as Netflix, it might be important to check whether the level of DRM support, or whether any DRM is actually installed. This could easily be checked thanks to DRM Info app. And sadly, even the basic Widewine security Level 3 is not installed. As a reminder, Widewine Level 1 is required for HD and UHD video playback. Visit “Where to get video, audio and images samples” post and comments section for links to video samples. Amlogic S905 SoC can support Gigabit Ethernet, but K1 Plus is only fitted with Fast Ethernet components, and file transfer performance is under average at about 6MB/s (48 Mbps). It looks better while using iperf with “-t 60 -c 192.168.0.104 -d” to test dual duplex transfer for 60 seconds, with a very good Fast Ethernet performance. 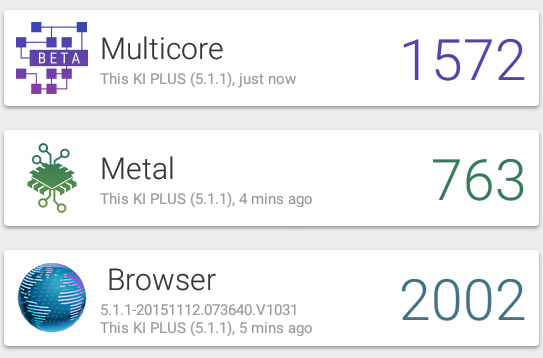 Bluetooth is not support by KI Plus. FAT32 (micro SD card), NTFS, & exFAT (USB hard drive) partitions could all be mounted, but the same bug as on Amlogic S812’s Android 5.1 firmware meant the free space was wrongly reported as 10MB, making the NTFS and exFAT partition basically read-only. I had to skip USB storage benchmarks, but I could still check out the internal storage with A1 SD bench app, which reported 22.71MB/s read speed and 8.67 MB/s write speed. Clearly not the best performance, but it was to be expected for a $40 products, and I have not found it to affect the performance of the device much. I have never seen Candy Crush Saga on device expect when using SoC with Mali-400 GPU, and it played without issue on K1 Plus ising an air mouse. Beach Buggy Racing felt a little sluggish, and once I boosted the graphics settings to “high resolution” it started to become choppy, and at time the game seems to be slow to respond to gamepad inputs. Riptide GP2 was about the same story, but it started pretty well, then set the graphics setting to high resolution, and the game was quite not as smooth, and the game even exited/crashed once. Furthermote, I noticed the frame rate to get worse, the more I played, so the GPU must be throttling when the SoC gets hot, leading to performance degradations. So Amlogic S905 does not seem the best platform for gaming, and better stick with the more powerful Amlogic S812 or Rockchip RK3288 SoCs. 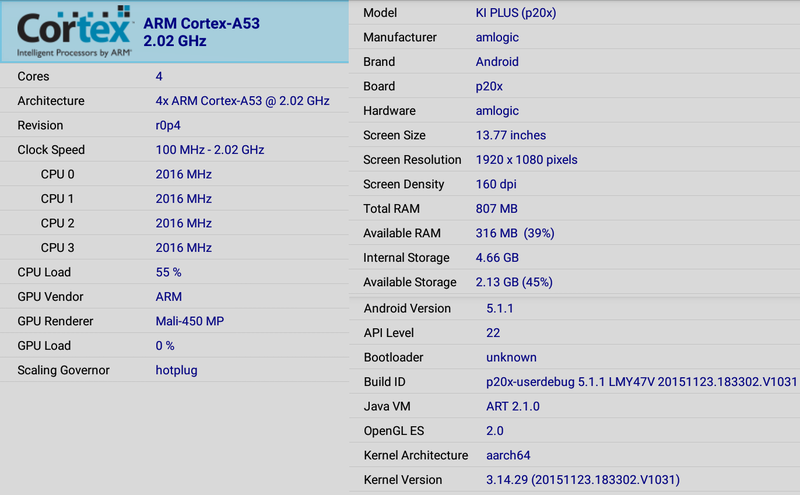 The app does not know Amlogic S905 processor, but it probably detects an ARM Cortex A53 quad core processor clocked between 100 MHz and 2.02 GHz, coupled with an ARM Mali-450MP GPU. The model is called KI Plus (p20x), the board p20x, the UI resolution is set to 1920×1080, there’s 807MB total RAM in the system, and 4.66GB internal storage. It’s running an aarch64 Linux kernel version 3.14.29 as reported previously. 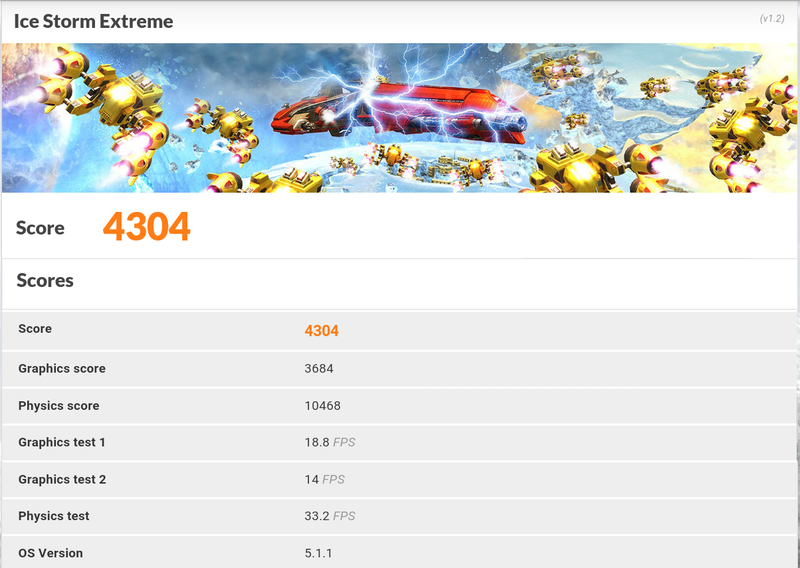 I had already run Antutu 5.7.3 to compare Amlogic S905 and Rockchip RK3368 performance, but following the firmware update, I ran it again, and it yielded a marginally higher score of 29,167 points. Please also find Vellamo 3.0 and 3DMark Ice Storm Extreme results below for reference. It’s quite amazing that you can now get an Android TV box with 4K video playback and HDMI 2.0 support for about $40. However, there’s still work to be done, as while their a good based with a reasonably good user interface, and surprisingly smooth video playback at 2160p resolution using Video Player app, the pre-installed Kodi 15.2 version was unusable at 4K resolution with most videos letterboxed, DTS and Dolby licenses are missing, there’s no DRM installed at all, and various other bugs need to be fixed. Dolby 5.1, DTS and TrueHD audio pass-through is working. Pre-installed Kodi 15.2 version does not work well for 2160p video output is selected (1080p output looks better); automatic frame rate switching is not working either. HDMI – Dolby Digital 7.1+, DTS HD and Atmos pass-through not working; CEC not working; Video output resolution set in settings is not always used at next power on. 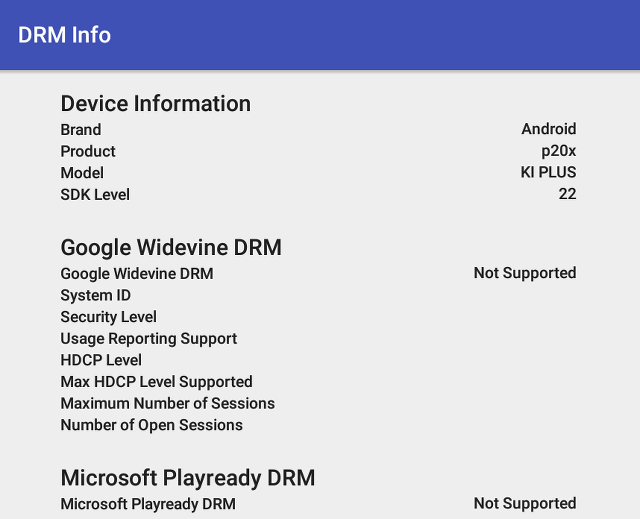 No DRM installed, even Widewine Level 3 required for SD playback on relevant apps. 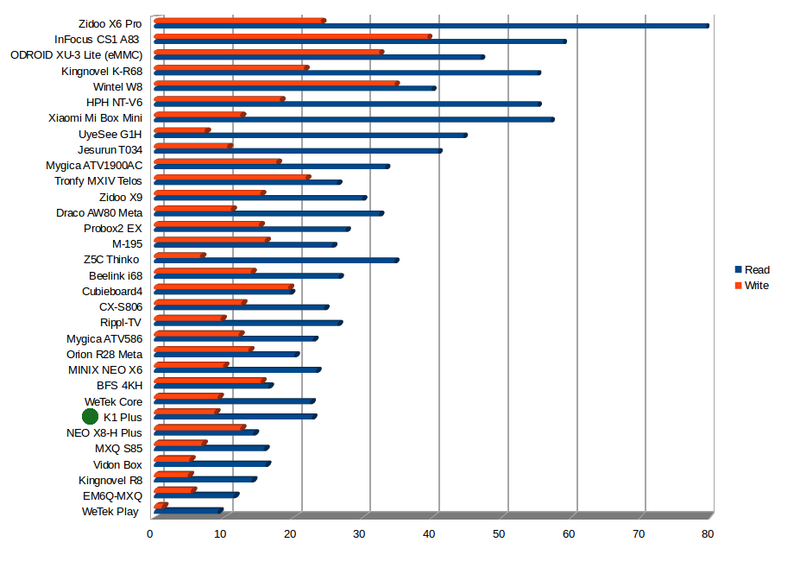 WiFi performance may be erratic (TBC), very good sometimes, and near stall speed at others. 3D games such as Beach Buggy Racing and Riptide GP2 are not playing very smoothly, and performance may degrade with play time (and higher heat). No option to show status and notification bars, no Download icon in app list. USB hard drive partitions (NTFS / exFAT) reported as having 10MB free only, basically rendering the partitions read-only. There are also IPTV apps that depending on your point of view can be PROS or CONS, and OTA firmware update is missing, but this may be due to Videostrong being a manufacturer, and not a brand, so they rely on their customer to handle firmware updates with their own servers and branding. Videostrong was kind enough to send this first Amlogic S905 box sample for review, and if you are a distributor or resellers, you could contact the company via their Alibaba product page. Individual can purchase K1 Plus (aka Ki Plus) on retail sites starting at $39.99 including shipping on GearBest, GeekBuying, eBay, Amazon US, Aliexpress and others. Waiting for next device with Kodi 16.2 pre-installed, or maybe a Kodi 15.2 modified to work at 4K. Kodi developer are still working on it. I’ll check the version in MINI MX, and if it does not work, I think I’ll test MX Player playback instead, as it’s been a while I have not tested a device with MX Player in details. I should get Ugoos AM1 and MINIX NEO U1 soon, so I’ll have other opportunity to test Kodi on Amlogic S905. This doesn’t apply to amlogic devices with proper permissions, which will still use amcodec. Any build from 24th October will have this change and should make any device that uses the proper implementation of the Android API. Should you be able please test out these builds. Be warned that this is based on Kodi v16 and these are still devs builds and caution should be taken. As we just implemented this change there could still be some minors bugs that could pop up with the variety of devices that will be solved during coming weeks. In case you have a problem with video playback please provide proper debuglogs and information. Failing to do so the problem will be ignored. Any device that is not able to do “android surface rendering” has not implemented the standard Android MediaCodec API the proper way. If this is the case please go ask your device manufacturer to do a proper job and release a fixed FW version. We as Team Kodi are not responsible for broken or bad firmware by device manufacturers. We will no longer implement any hacks or workarounds. 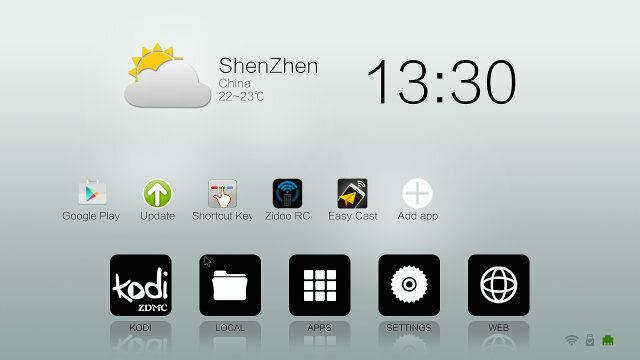 Don’t be naive, none of Chinese companies will contribute to Kodi, they will only take advantage of it. Only me, koying and cpl other guys are working on amlogic support. 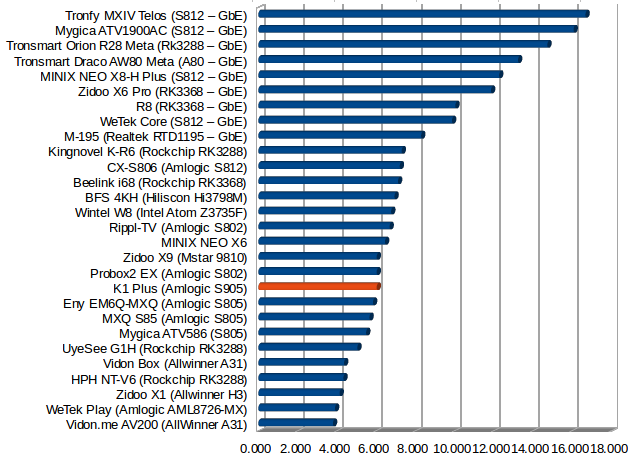 @natsu kodi-team go right way move to standard android API mediacodec, they can’t support all ARM soc. This one or the beelink mini mx s905? Or too early to tell? I have not reviewed Beelink MINIX MX yet. So you’d need to wait. I’d expect similar performance and issues, but the specs are slightly different, so people may end up choosing one over the other based on their requirements. In your expert opinion witch is the kody version to use with this device, for now? And by the way, thanks for your work, and the rest of your partners. 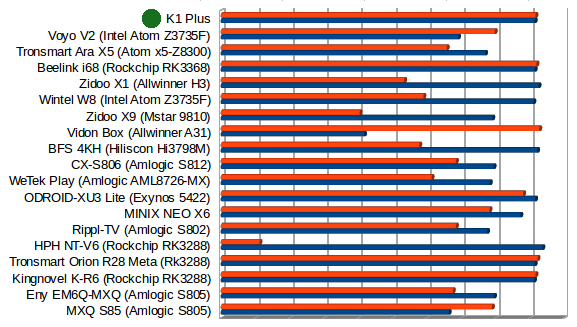 I was hoping for the Venz K1 plus hybrid, please review that if possible! No Kodi version is using amlcodec (native decoding libs) on S905. All Kodi versions for now are using MediaCodec only for now which is not working good. Basically, it looks like it runs on AndroidTV version of Android. Thats why there is no Bluetooth, GPS or telephony features. Same with other issues. 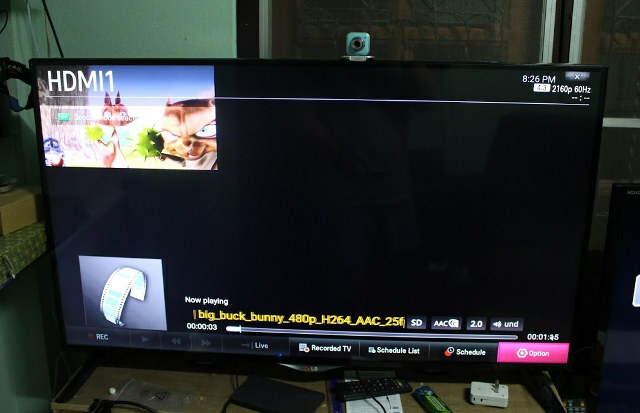 AndroidTV on 4k devices works in 1080, even though can play 4k contents. Your screen from setting menu confirms it. Now that you mention it, it does indeed look similar. Home screen Launcher exactly the same. Please report Eny Technologies / Acemax manufacturing the box. I only have MeLe F10 Deluxe, but there are the usual limitations. Game mode can only work with MeLe device, so K1 Plus won’t work. The Home key won’t work, so I normally used the icon in the status bar. You could probably make the Home key work by tweaking some files in Android (not sure which one), and I asked MeLE if they had an app or method to change this a while ago, but they did not reply to my email. oki,thx for u reply, so no gaming with the gyroscop mode? for resolve 720p problem with kodi 15.2 playstore. 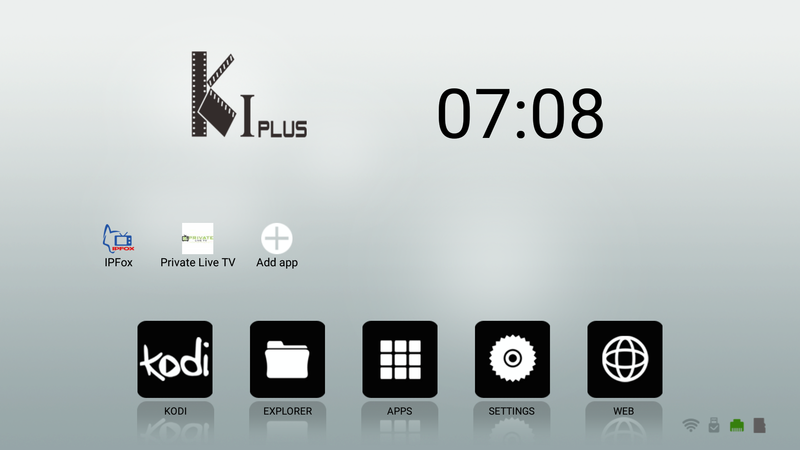 i have installed kodi 16beta 4 in my k1 plus, and 1080p works . U can test kodi 16 with your 4k videos? Correct, no gaming with gyroscope using the MeLE air mouse on that box. We’ve switched to other hardware platforms. You can find 4K videos @ http://www.cnx-software.com/2010/03/17/where-to-get-video-audio-and-image-samples/#comment-32111 and other comments in that post. Is VideoStrong the manufacturer of this STB, or Acemax? Bluetooth works fine! I plugged in my mini keyboard doungal and it it just worked. not sure about other bluetooth features but the basic $10 keyboard works great. Have been using MX box for about a year to view Genesis, sports devil, film on and other general add-ons. Thinking about buying new MX box. From all the testing and some negative results is now a good time to buy into S905, 64 bit and Android 5.1 or should I wait. I just got this device last week. Are thoose pictures made with the new firmware or with the old one? The pictures were made with the latest firmware available at the time of review. I have an issue with the volume that randomly goes up and down…sometimes is very annoying as it happens 3-4 times per minute…anybody else? I’m not sure if it would work on K1 Plus “standard”, although the mainboard is the same. I got one just last week. I added a 32 gig micro sd card and ran out of space after less stuff was added than I have on my kindle firs 2nd gen. Nothing was added to the 32 gig card. is there a way to tell the device to write to the card? Also I got a wireless keyboard and mouse to work with it. They use a dongle for both that was made for the PC, both are wifi. This is the updated firmware that the supplier whom I purchased from supplied me with. I have updated my device and it seems to be working fine. Not sure what has been updated as no change log supplied. Could You please tell me how You updated? My K1 PLUS doesnt accept this update. The update procedure stops with Status 7 error. I tried to install from TF card and from USB drive too. I tried to install several updates, but none of them could installed. I tried to install from USB and TF card too, but every firmware installation stopped with Status 7 error or could’nt mount the install route. I tried from sw and recovery too, but all of them just stopped. Maybe there is some problem with the recovery, it’s updated as I see, but it’s not accept any firmware. Make sure the USB drive or micro SD card only has the files needed for firmware update, and only one USB drive or micro SD card is connected. I’ve seen the system get confused at times when multiple drives are connected, or other files are located in the file system. I don’t know what Status 7 means. Any text accompanying the error? In the beginning there was only the zip file on the sdcard. One time only 1 device was used, i used an sd card reader on the USB port with the same sd card. 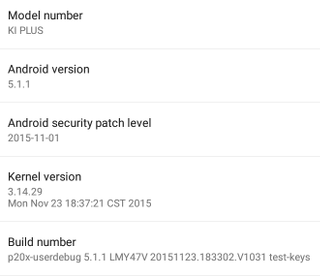 Status 7 is a security alarm, which means the device is not fit to the update rom(based on google searches). Maybe there are multiple hw versions? I updated it using a 16GB USB stick, which worked correctly. I could not get it to work using the Micro SD card. I’ve managed to flash all the various firmwares around on my device and they have worked fine. I assumed that the device was generic. Till this time I had the regular setup, there is no bug yet. I can install from Play and there was no volume adjustment(10-15 min). The Kodi is not updated, but MX Player is in the default apps. I could install Twitch, which was the main reason of wanted to update, it’s working pretty fine. Next step is to restore Kodi. Hello, i have this box at home with android 5.1, and i try to install two APK from PlayStore, but no succes. PlayStore told me “this software is not compatible with your device”. But i can install this two APK on my smartphone, android 5.1. You should update then to a newer version.